Education and advocacy are the tools we use to fulfill our mission of lake protection. But as an organization, we recognize the need for more research on our lakes. 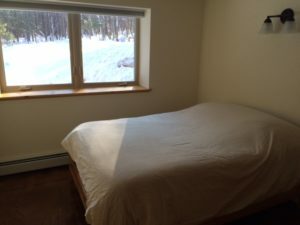 In response to this need, LEA created the Maine Lake Science Center. Plans continue to move forward on this dynamic project which provides a hub for research and also allows us to expand our educational capabilities. Activities began at the Center in June of 2015 and it became fully operational at the end of 2017. So, what exactly is the Maine Lake Science Center and why do we need it? 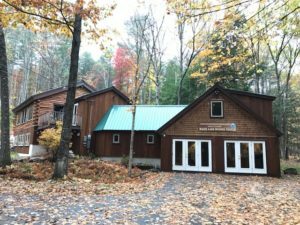 The Maine Lake Science Center is located on an 18-acre wooded lot in Bridgton, abutting 66-acre Pondicherry Park. An existing building on the site has been renovated to provide researcher housing, a conference room, a lake laboratory, a staff office, a trail with a low element challenge course and interpretive signage, and parking access to the trails. The Center serves as a hub for world-class lake research by providing support for researchers in Maine and beyond who come to study our lakes. 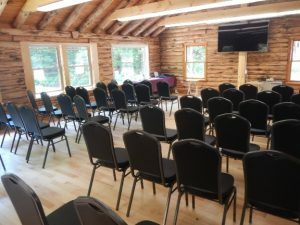 In addition, the property allows us to expand our educational offerings by introducing field training and classroom work at on-site educational facilities. Maine lakes and their watersheds comprise much of the land area in a majority of Maine towns, yet few resources have been devoted to their study and protection. The Maine Lake Science Center is a powerful voice for change throughout Maine and beyond. We view the Center as the next logical step in LEA’s development and a rare opportunity to accomplish our mission before irreversible damage is done. The Science Center is an extension of LEA, guided by its own Lake Science Advisory Board, but under the jurisdiction of the LEA Board of Directors. The Lake Science Advisory Board consists of university and college professors, scientists and lake managers from across the state and the country. For more information about the board, view the Lake Science Advisory Board White Paper. 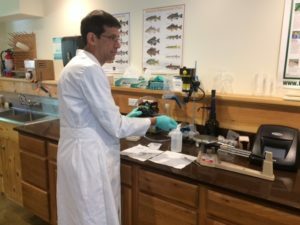 The Science Center works under the guidance of this board to actively pursue projects that will greatly enhance our understanding of freshwater bodies, using the lakes, ponds, and streams in our area and throughout Maine as study sites. In this way, the breadth of knowledge in the field in general will grow, and at the same time, LEA will acquire some of the most detailed information attainable on the lakes and ponds in this region. The Center works closely with the academic community, other caretakers of lake and watershed study sites across the country, and non-profit organizations with similar goals. Projects will continue to be sought out to give us more information about our lakes and ecosystems and how people use, understand, and interact with them on all levels. 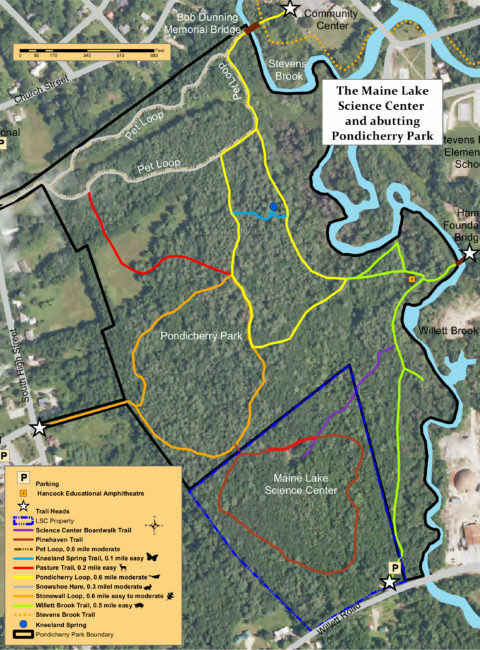 Map showing location of Maine Lake Science Center and Pinehaven Trail, abutting Pondicherry Park.